Arlington students march against police killings | Fight Back! 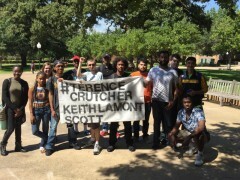 Arlington, TX - About 20 students and supporters marched through the University of Texas at Arlington (UTA) campus during the noon hour, Sept. 21, carrying signs and chanting slogans against police brutality. The march was organized by Progressive Student Union. Mark Napieralski, president of PSU, said that although the march provided an important opportunity to speak out on the recent police killings of Keith Scott and Tyre King, the protest had actually been planned for some time and is part of a campaign against police brutality that PSU is conducting. “We will be working against police brutality all semester, with the specific goal of getting UTA to take a clear stance against police brutality,” Napieralski explained. The campus was a busy place, with many students out and about going to class or lunch and a large number of student organizations operating tables. Onlookers mostly responded positively to the march, flashing peace signs, clapping, and in a couple of cases joining in the march briefly. Slogans included “Indict, convict, send those killer cops to jail,” and “If we don’t get no justice, they don’t get no peace.” Signs mostly carried the phrase “Black lives matter,” others bore the names of Tyre King, Terence Crutcher and Keith Scott.